I love Bay View, and now I know even more about it! This past weekend was FULL for myself, my husband, and my father who was visiting from out of town. His visits always prompt us to do things we’ve never done in Milwaukee (we have only been here a year and a half). We had an amazing dinner at Braise, pork fat budino… what!?! We went to the zoo, the elephants were my favorite. We went to the State Fair on a super busy day, so I was a little overwhelmed, but the trip did produce this great photo of cows, rotating while simultaneously diminishing in size. I’m not surprised to say, however, the most fun, educational and inspiring outing we had was our trip to the SSFM. My father had just brought us a truck full of vegetables, so it wasn’t necessary to stock up on food. 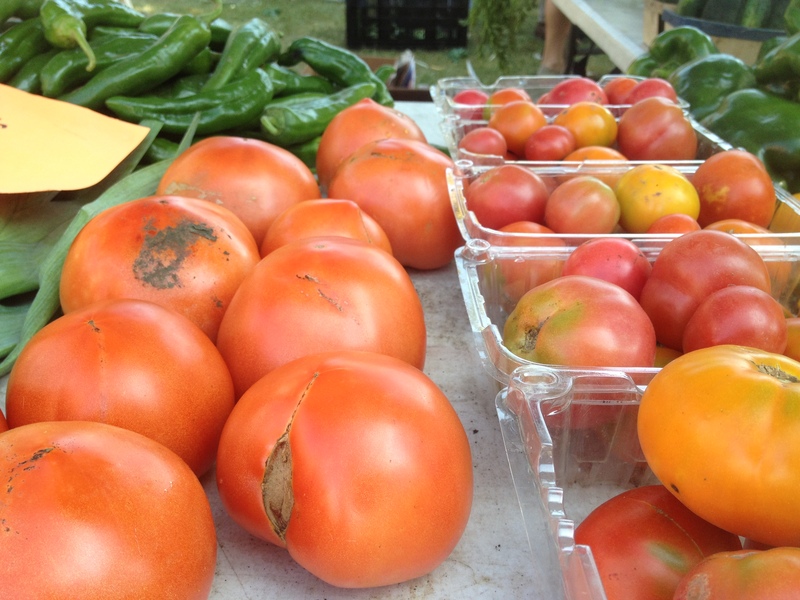 I did, however, spot some amazing looking door county peaches, and as market manager Adam Horwitz put it, all the ingredients for ratatouille had finally arrived (tomatoes, eggplant, peppers, basil, etc…)! Another new arrival was the SSFM CD, featuring music from various entertainers who have performed at the market throughout the years, pretty good deal at only $10, I plan to pick up my copy tomorrow at the information booth! 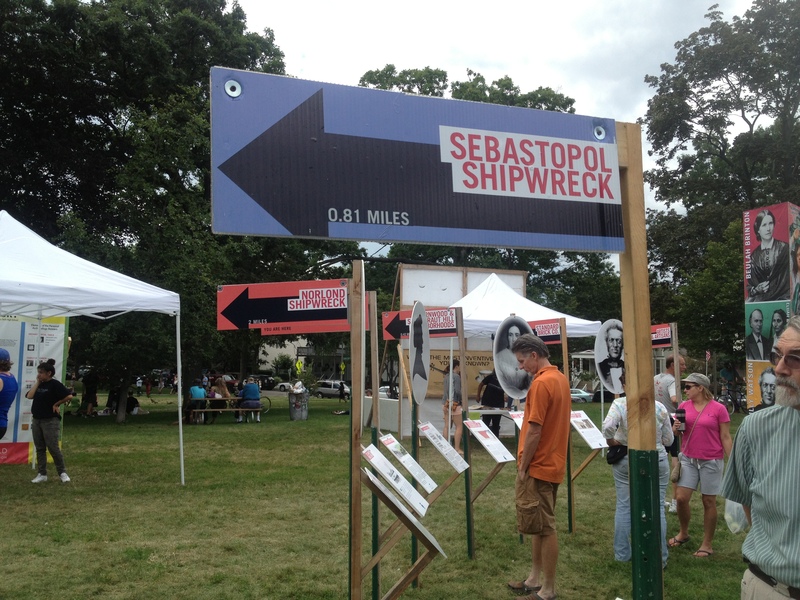 Perhaps most interesting was the presence of the The Milwaukee Observatory pop-up museum. This program is a collaboration between Discovery World, Bay View High and Bradley Tech High. What I walked upon was a very impressive installation, complete with well designed, engineered and built signage communicating a stunning amount of information about the Bay View neighborhood. What was even MORE impressive were the high school students and recent graduates who are involved with the program. What bright young minds. 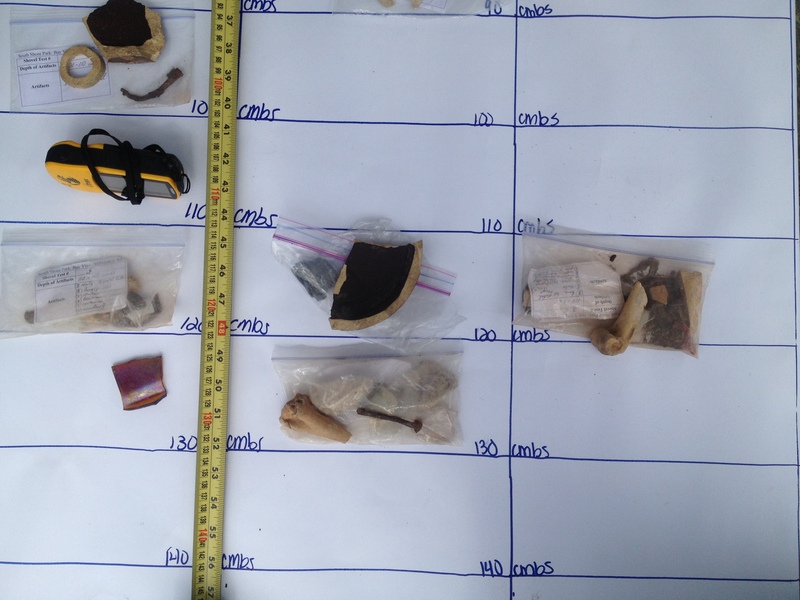 They gave me a tour of the pop-up museum, feeding me facts about historically significant trees, homes, and artifacts from an excavation they had conducted (pictured below). I spoke with the Bay View High Principal, who was delighted to be a partnering school, and humbly passed my questions onto the students. Seeing the evidence of this multi-faceted, multi-disciplinary approach to education left me feeling optimistic about the future. I encourage you all to seek out their next pop-up museum, and you must talk to the kids while you’re there. Last but not least, you know what’s coming, it’s the DOG OF THE WEEK! That’s Rocky on the right and Cooper on the left. What sweethearts! Both Golden Retrievers, both 9 years old. Their mom got them when they were one. 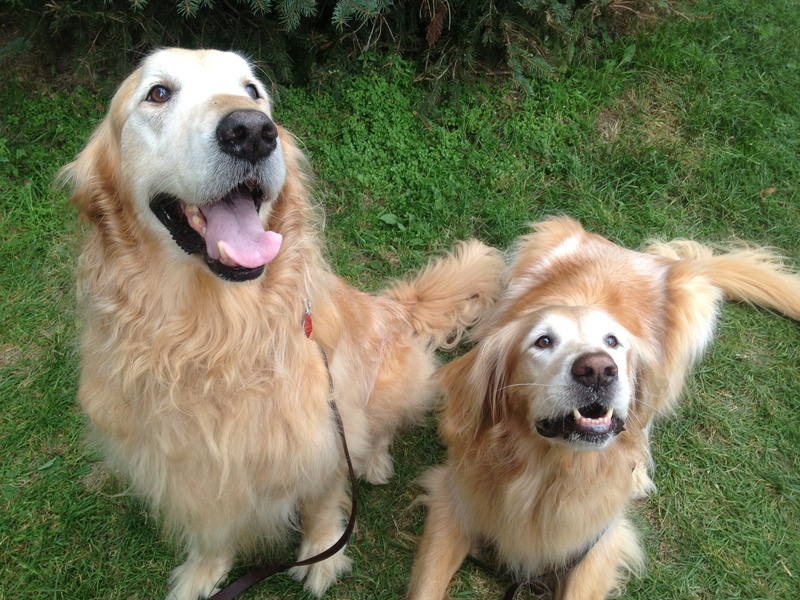 You might see them at Colombia St. Mary’s where they both volunteer as therapy dogs. Mandolin music brought me back to life. Well, I have been very busy. From mid July to early August I have been traveling, hosting guests, and starting a new job. It has been marvelous, but it also means I’ve missed a few SSFM’s and a few blog postings. This is a little snippet of the July 27th market, and I’ll post another about the August 10th market soon. The day was warm, and I was exhausted. I’d flown back from Maine the night before after what can only be described as a two week art bender at Haystack, where my finest culinary experience was eating fresh lobsters on the rocks with seals swimming by, but I digress. I’m pretty sure we ate ALL the breakfast sandwiches available at the market, drank iced coffee and juice, and collapsed onto the grass, too exhausted to make the extensive 1 mile journey home until the food I’d just consumed provided nourishment. Usually, we get to the market right at 8am, buy our produce and are out of there by 9:30 or 10. Good for taking care of business (TCB) but bad for watching the entertainment. 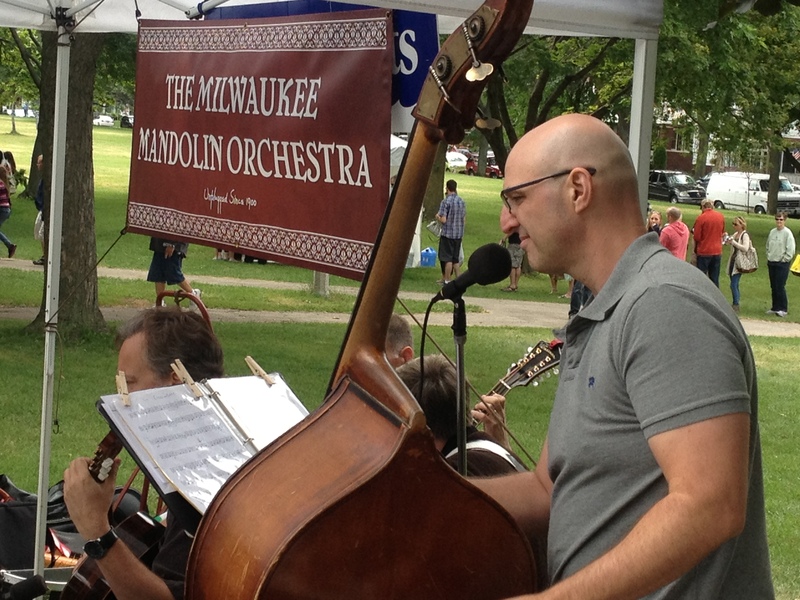 I am SO GLAD we didn’t miss it this time because the Milwaukee Mandolin Orchestra (their performance name) was truly fantastic. They are a non-profit organization, called the Bonne Amie Musical Circle, who have been in operation continuously since 1900. 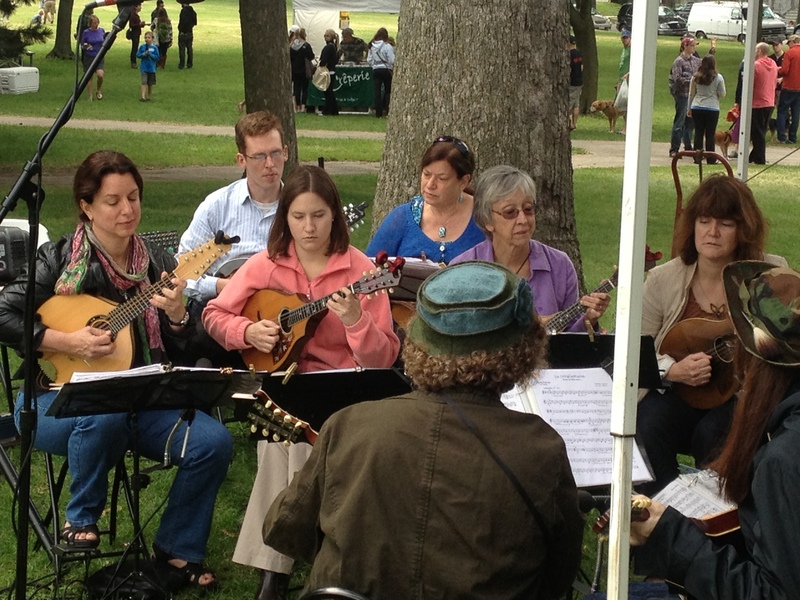 In their mission they state that Members of the Circle shall preserve, study, and perform before the public music that is written or adapted for the mandolin orchestra on traditional mandolin orchestra instruments. 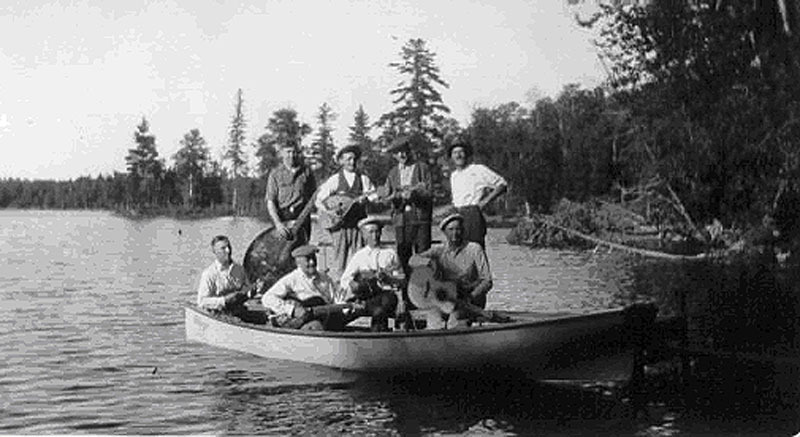 Their website has a section of historical photos from the various eras, including this photo of the band trying their luck at performing in an unusual setting. On this fine morning, they played traditional songs. There was amusing banter between the cellist and the guest singer (the two with microphones). There were little kids dancing. There was a big ol’ smile on my face. It was a good reminder to forget those household chores on Saturday morning, sink into the market and experience all it has to offer. 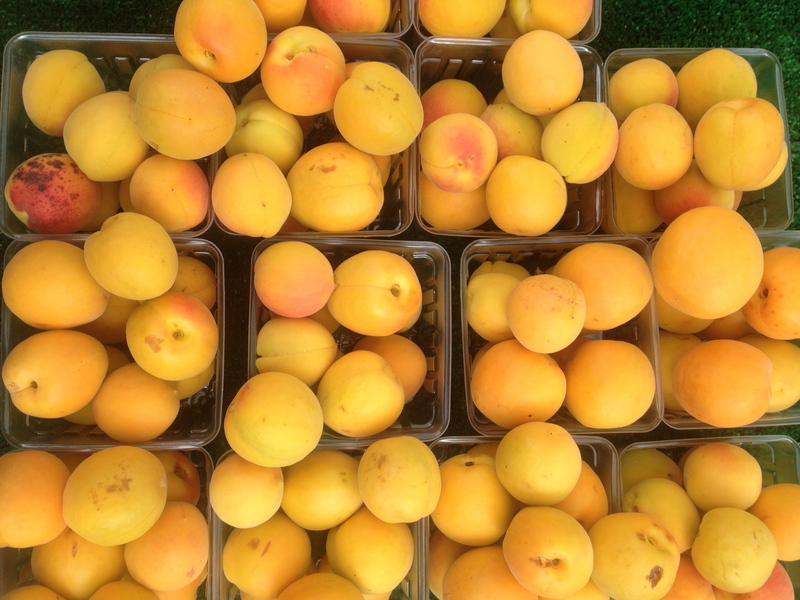 We didn’t buy much food, as our garden is starting to produce, but we did get apricots from Door County, which were positively amazing, and a few hunks of havarti. 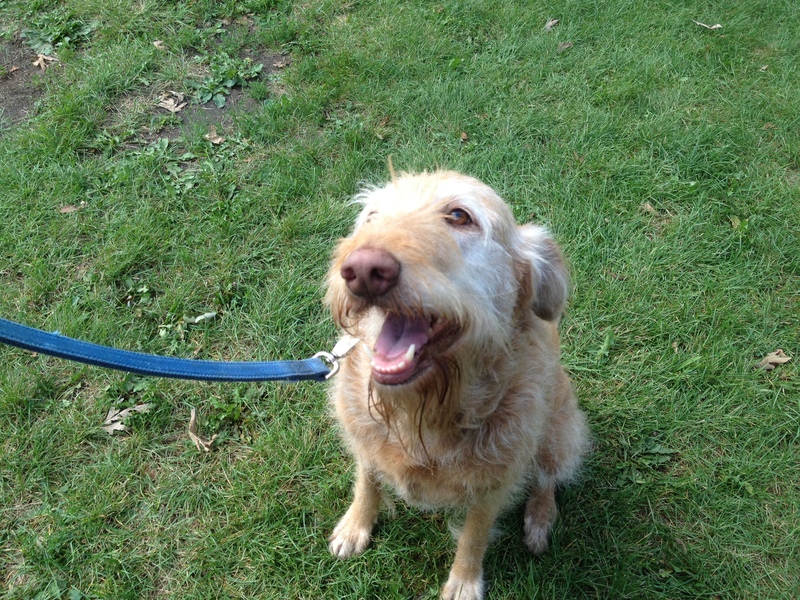 And now, for the 7/27/2013 DOG OF THE WEEK! Meet Gilly Rose! This dog was so cute and funny, with a tuft of hair on top of her head, and a little beard, leaning up agains her mom lovingly, we couldn’t resist. She is a black lab-poodle mix, bred by a high school student who sold the puppies to family friends in an effort to raise money for college. The best part is that all the owners get together every year for a dog birthday party, the dogs are now 7.5 years old. 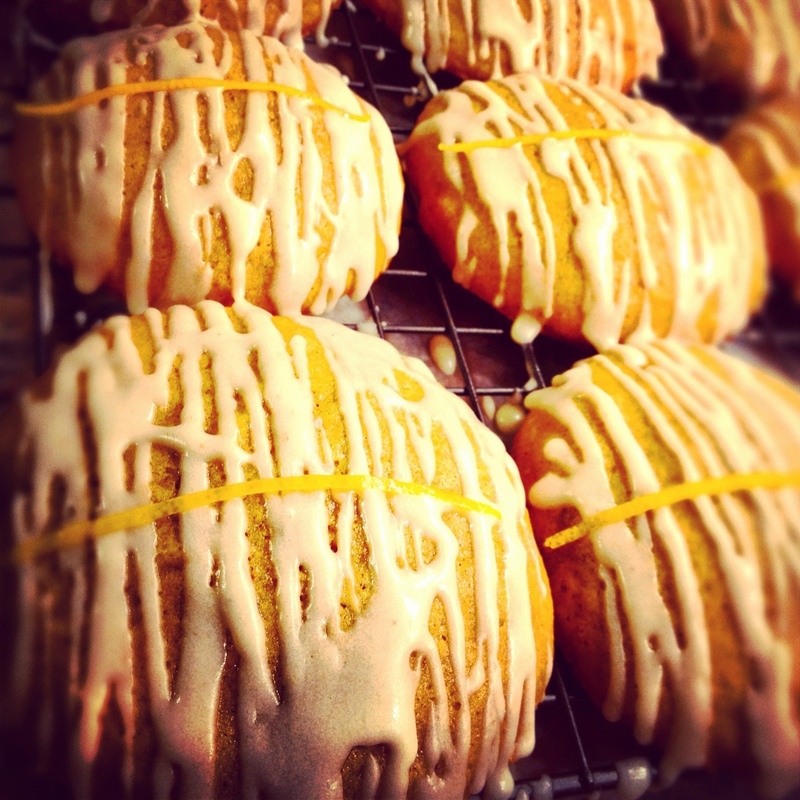 Grey Ghost pumpkin cookies w/ginger frosting and Meyer lemon zest.